Boyden chambers assay is a useful tool to study cell migration and cell invasion such as chemotaxis, haptotaxis and transmigration. It consists of a cylindrical cell culture insert nested inside the well of a cell culture plate. Clonogenic assay or colony formation assay is an in vitro cell survival assay based on the ability of a single cell to grow into a colony. 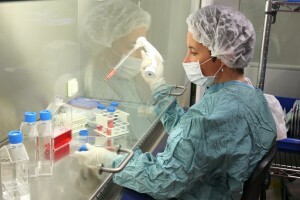 It is the method of choice to determine cell reproductive death after treatment. 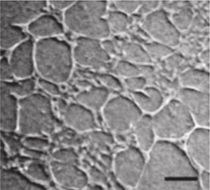 The spheroid sprouting assay consists of a self-aggregation of lymphatic endothelial cells (LECs) embedded in a 3D matrix. This system allows to determine the area occupied by the migrated cells and their spatial distribution. Tubulogenesis assay consists of lymphatic endothelial cells (LECs) cultured between two layers of type I collagen. This systems allows to determine the area density of capillary-like structures formed by LECs. This system consists of ex vivo culture of fragments of thoracic ducts dissected from mice. This assay allows to study the sprouting of lymphatic capillaries from an authentic lymphatic vessel. This assay allows the assessment of the migratory capability of lymphatic endothelial cells (LECs). Immunosuppression can be evaluated by cell cycle analysis of PBMC stimulated (or not) with anti-αCD3/CD28 microbeads and cultivated during 4 days with or without test cells (MSC…). Cell cycle analysis is performed using the CycleTEST Plus DNA Reagent Kit and acquisition by flow cytometry. Immunosuppressive properties of cells are quantified by their inhibition of stimulated PBMC-induced proliferation. The Flexercell ® FX4000™ is a computer-regulated bioreactor that uses vacuum pressure to apply cyclic or static strain to cells, cultured on flexible-bottomed culture plates. The force exerted and its frequency can be modulated. This model allows the study of traction on the metabolism of cells. 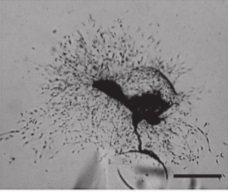 It helps to study the effects of mechanical forces of various intensities and frequencies on the phenotype of adherent cultured cells. Moreover, different types of forces (tension, shear stress, compression) can be applied in 2D or 3D models. The rotary cell culture system is a device designed to grow 3D cells clusters (tissues, cancer tumors and virus cultures) in microgravity (outside the body). 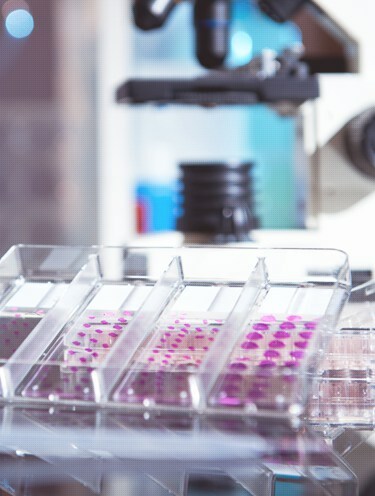 The advantage here is to obtain larger and 3D cell cultures with structural and chemical characteristics similar to normal tissue, in comparison with lab-grown cell cultures. Each of the two special form Caesium-137 sources has a nominal activity of 55.5 TBq (1500 Ci). Together they produce a central dose rate of 1.0 Gy/minute (100 rad/minute) ±15% in the sample container. An attractive feature of human induced pluripotent stem cells (also known as iPS cells or iPSCs) is the ability to derive them from adult patients to study the cellular basis of human disease. Since iPS cells are self-renewing and pluripotent, they represent a theoretically unlimited source of patient-derived cells which can be turned into any type of cell in the body. The researchers at GIGA developed the expertise in deriving iPS from skin fibroblasts by introducing a specific set of pluripotency-associated genes. Upon introduction of reprogramming factors, cells begin to form colonies that resemble pluripotent stem cells which can be isolated based on their morphology, conditions that select for their growth, or through expression of surface markers or reporter genes. iPSCs are capable of differentiation in a fashion similar to Embryonic Stem Cells into fully differentiated tissues. The Hematology unit of the CHU and several teams at GIGA are specialized in the study of hematopoietic and other stem cells (e.g. mesenchymal stem cells, neural crest stem cells). This includes investigations of stem cell biology, purification and expansion, as well as the therapeutic use of these cells in the context of hematopoietic cell transplantation and solid organ transplantation, immunotherapy of cancer, auto-immune diseases and regenerative medicine. Our researchers at the ULg have developed an innovative chitosan-based scaffold for wound repair and tissue engineering. This new scaffold-type has unique structural properties that stimulate the healing process and improve of the overall quality of the repaired tissue through a more adequate revascularization, re-epithelialization and remodeling of the granulation tissue. Easy-to-handle, and large potential for re-modelling. Excellence in biostatistics is a core strength at CHU/ULg. Our talented biostatisticians offer a depth of knowledge and experience in all aspects of clinical research from study design, document preparation for ethic committee review, data analysis, results interpretation to final report. WinBUGS: software system used for Bayesian analysis using Markov chain Monte Carlo (MCMC) method. It is based on the BUGS (Bayesian inference Using Gibbs Sampling). Regarding safety, the University Hospital offers an optimal security system for the storage of electronic data. The system is subject to regular revisions, both physically and technologically. Moreover, the data security system is approved by the Sectoral Committee of the National Register. The University Hospital has a data security policy as well as a “Code of Ethics and Patient Data Secure”. This document is made available to the Committee. The CHU Laboratory of Cell and Gene Therapy (LTCG) has developed a strong expertise in basic research on in vitro and murine models, in the production of cellular product batches (ATMP) and in running related phase I/II clinical trials. The GIGA viral vector platform has a large expertise in the production of retro/lentiviral/AAV vectors and the generation of stable cell lines. Our retro/lentiviral vectors (2nd or 3rd generation systems) contain all necessary biosafety features. CRISPR-Cas9 is an RNA-guided genome editing system, which can be used for gene disruption, gene knock-out, gene mutations and controlled gene insertion. We are able to produce lentiviral vectors expressing Cas9 and RNA guide for targeting your gene of interest. We have established a partnership with Sigma Aldrich and are members of Sigma CRISPR Core.